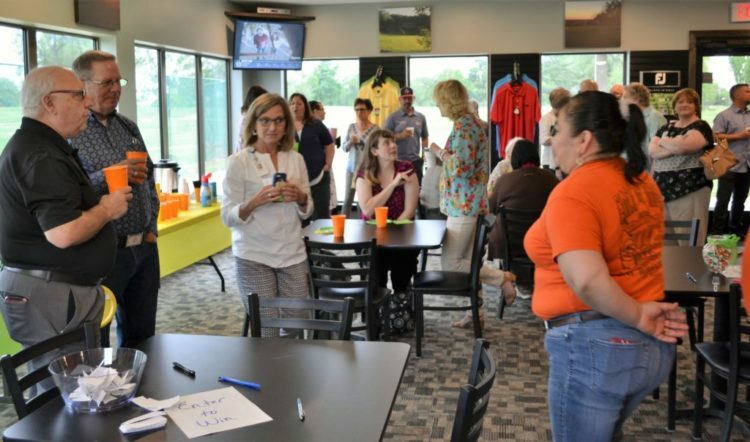 Chamber members mingle for the social time before the announcements at Thursday’s coffee at Woodland Hills Golf Course. 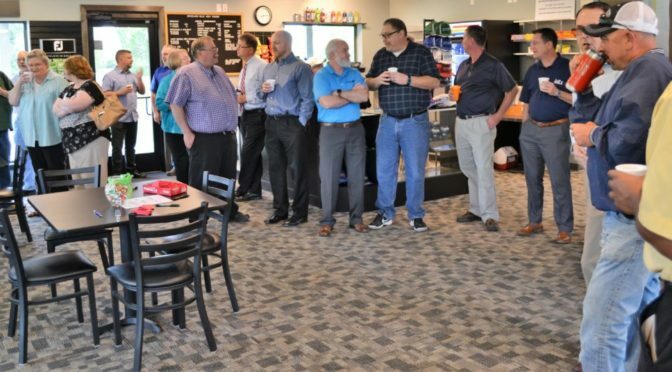 The Fort Scott Chamber of Commerce weekly coffee is hosted by members at a different location each week of the year, except Thanksgiving and Christmas. 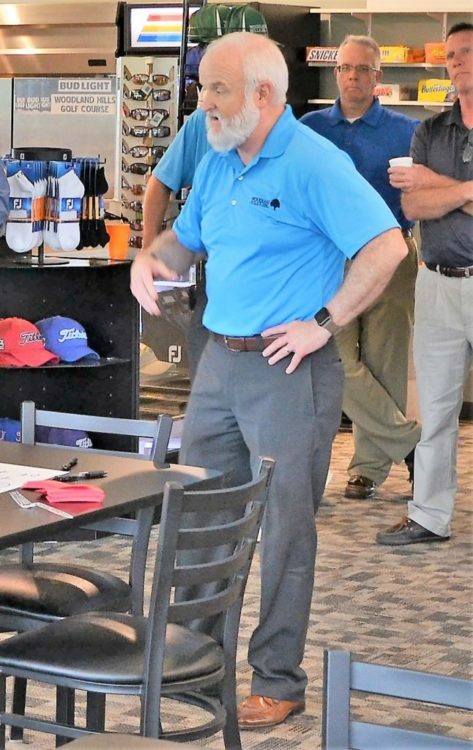 This week it was held at the Woodland Hills Golf Course on South Horton Street, hosted by the City of Fort Scott, who is the owner of the course. At Chamber coffees, members may tell of events in their respective businesses and organizations and share a cup of coffee beforehand. The host of the coffee then tells about the business/organization. Lead Bourbon County, a leadership exploration and development program, finished the nine-month-long classes Thursday, Deb Needleman, co-facilitator said. The class project is creating modules for mentors to use with high school students in time together. A new class will be starting in September and runs until May. Contact Needleman or Robert Uhler for more information. This Saturday, May 12, the U.S. Post Office employees are initiating a food drive with residents leaving bags of non-perishable food by their mailboxes, according to Sue Emmons. Emmons is director of The Beacon, a helping agency, and recipient of the food drive. Fort Scott FFA and Michele Lyon are helping with the drive, she said. Next week is National Nursing Home Week and Medicalodge Fort Scott will celebrate with residents, Lynnette Emmerson said. They will be celebrating the 1920s on Monday, 30s on Tuesday, 40s on Wednesday, 50s on Thursday and 60s on Friday, she said. Jerry Witt, with the Riverfront Authority Board, said there will be a ribbon cutting for the new pavilion May 17 following the Chamber coffee at 8:45 a.m. At 6 p.m. that evening there will be free hot dogs, chips, dessert, and watermelon, Allen Warren, another member of the authority, said. At 6:30 Jason Richison and Kinley Rice and a country-western band from Oklahoma will perform. In case of inclement weather, the performance will be moved to Memorial Hall. Warren also told the group that Friday and Saturday the Pioneer Harvest Fiesta is having a swap meet at the Bourbon County Fairgrounds. There will be concessions available. Maps are available for the town-wide garage sale this weekend from the Chamber website, Executive Director Lindsay Madison said. Briggs Auto has a car sale going on and has positions open as well, Carol Lydic said. On May 18 the Carson Barnes Circus will have two shows, one at 4:30 p.m. and one at 7:30 p.m. at the Bourbon County Fairgrounds, Madison said. The event is sponsored by the Chamber. At 11 a.m. there will be an educational session about the circus and 3 p.m. there will be an elephant wash with the Fort Scott Fire Department performing the duties. Tickets can be purchased at the Chamber for $14 adults, $6 child. At the door, the costs are $20 adult and $12 child. Bill Drury’s A Passion For Service Seminar will be offered May 22 in the a.m. and p.m. at the Empress Event Center, Madison said. Fort Scott City Manager Dave Martin tells the history of the Woodland Hills Golf Course at the Chamber Coffee Thursday morning. City Manager Dave Martin gave a background of Woodland Hills Golf Course: The city bought the property in 2011 “at a good price”, hired Jon Kindelsparger, took five years to see a difference in the course, (but) revenues have steadily increased. Kiwanis Tournament, May 18, to raise money for scholarships; Memorial Day weekend, there will be a three-man scramble; June 9 at Mercy Hospital Scramble to buy new equipment for the hospital. I implore you to put aside your circus nostalgia and do a Google and YouTube search on “circus elephant abuse”. Carson and Barnes Circus is a habitual offender of laws meant to protect the public’s safety and animal care. The circus has disguised itself for decades as a fun family event, but there is nothing funny about pain, there is nothing amusing about cruelty, and there is nothing amazing about an animal being forced to do something for fear of torture.